Send 1 monster you control to the GY, then target 1 of your banished “Six Samurai” monsters; Special Summon it. You can only activate 1 “Secret Skills of the Six Samurai” per turn. The new Six Samurai support did one good thing: bring Gateway off the list. Like many Six Samurai players, I’m not a big fan of the new Six Samurai support. There are some benefits to them, but the support I feel could’ve been better. Anyways, today is Secret Skills of the Six Samurai, a quick-play that’s a 1-for-1 involving your field and banished zone. Lose a monster and Special Summon a banished Six Samurai. Once per turn, the card isn’t restricted to sending a “Six Samurai” to the grave, but you can’t send something like a token to the grave. You can Special Summon Secret Six Samurai – Kizaru and get a search, and Hatsume banishes two Six Samurai to Special Summon a Six Samurai from your grave. This card can only be played with Six Samurai that use the new support or banish a lot. I only banish with Enishi Shien Chancellor (though I’ve used that Legendary Enishi as well). Secret Skills of the Six Samurai is a QuickPlay Spell Card that lets you Special Summon a Six Samurai monster from the banished zone at the cost of sending one of your monsters to the grave. You can only do this once per turn, but I like the idea of Special Summoning something during the battle phase to push for game. Ideally there will be better support to utilize banishing of Secret Samurai monsters, other than the included Secret Six Samurai. For now, Secret Skill of the Six Samurai does help with the swarm and should be considered in a Six Samurai deck. It seems the Six Samurai support was the featured support of this set, which is sad because the Secret Six Samurai monsters leave more to be desired, and this spell isn’t too great even considering what the Secret Six Samurai theme does. 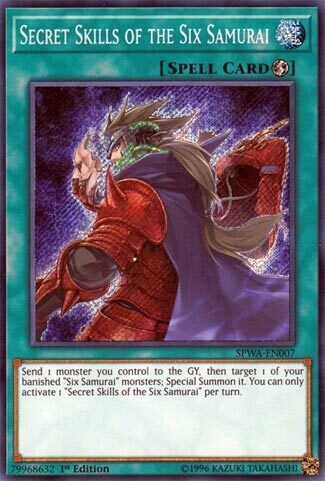 Secret Skills of the Six Samurai is a quick-play Spell that allows you to send a monster you control to the GY to summon a banished Six Samurai monster. You can only use Secret Skills once per turn, but eh. The best way I can see this used is with Hatsume to banish a Shi En from the grave and something else to summon a Level 2 Six Sam Tuner to Synchro into another Shi En, then use this card to send something to the grave to get the banished Shi En back. Other than that, there is no real use for this card that sounds great. As I said earlier, the Secret Six Sam monsters leave more to be desired, but at least there are two really good cards in there with Hatsume and Fuma.